Following refit and a restful holiday period, the submarine departed Pearl on 2 January 1945 for Saipan. There, on 15 January, she joined with SPADEFISH (SS-411), ATULE (SS-403), and POMPON (SS-267) and headed for her fifth war patrol in the East China and Yellow Seas. Bad weather and a lack of targets created few opportunities for BANG to attack any enemy shipping. On 19 February, she departed the area without any kills. She arrived at Guam on the 24th and underwent refit alongside Proteus. BANG's sixth and last patrol began on 25 March when she departed Guam for Luzon Straits. After ten days of patrol, she was ordered to take lifeguard station northeast of Formosa during strikes on northern Formosa and the southern Ryukyus in support of the Okinawa operation. On 21 April, BANG rescued a Navy pilot who had ditched his plane due to flak damage received in a strafing run. On 3 May, BANG departed the area on orders from the Force Commander. She refueled at Saipan and continued on to Pearl Harbor where she arrived on 18 May. After ten days of recreation and inspection of the boat, BANG was ordered to return to the United States and proceed to the Portsmouth Navy Yard for overhaul. She stopped at Hunter's Point, Calif., then continued through the Panama Canal and up the Atlantic Coast to Portsmouth, where she arrived on 22 June. The submarine was still in overhaul when the cessation of hostilities was announced. Postwar records officially credited BANG with eight kills for 20,181 tons of shipping. Her own war patrol reports claim 15 ships sunk for 94,000 tons. Regardless of the numbers, BANG contributed substantially to the allied efforts to restrict Japanese shipping. Following completion of the overhaul, BANG operated out of New London in the early postwar period. She was placed out of commission on 12 February 1947 and remained in the reserve fleet. On 1 February 1951, BANG was recommissioned, but she only spent 15 months on active duty with the Atlantic Fleet before being decommissioned on 15 May 1952 for conversion and modernization. 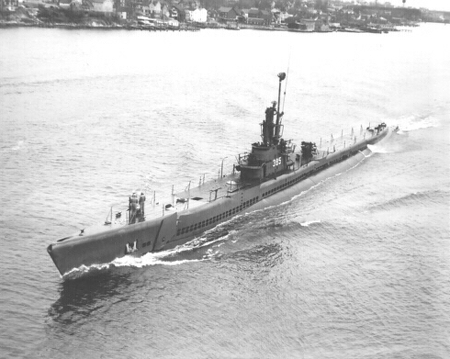 Following work at the Portsmouth Navy Yard, BANG was recommissioned on 4 October 1952 as a Guppy IIA submarine, the first of her type to be utilized by the U.S. Navy. Although her outward appearance remained the same, BANG's internal arrangements were improved and incorporated impressive advances in ordnance and electronic gear. The hull was streamlined and additional power added to the engineering plant to provide increased underwater speed. After operating with the fleet in the Atlantic Ocean and Mediterranean Sea for two years, BANG entered the Philadelphia Naval Shipyard for a routine overhaul in August 1954. Upon completion of the overhaul in December, BANG rejoined the Fleet with added modern equipment. She operated primarily in normal peacetime submarine patrols to train other submarines and surface antisubmarine units. She left her homeport of New London in July 1957 to begin another overhaul in Portsmouth. When she came out in January 1958, she resumed peacetime operations, including a Midshipmen Training Cruise during the summer of 1958 to Spain and Denmark, a four-month deployment to the Mediterranean and Northern Europe in 1962, and participation in Operation "Springboard" in the Caribbean in 1966. Between these cruises and major yard work in 1961, 1962, 1966, 1967, and 1970, BANG provided training services to Basic Submarine School in New London as well as to units of the Atlantic Fleet. Early in 1972, BANG was designated for transfer to the Spanish Navy on loan for five years. Following upkeep to lengthen her safe submerged operations limit, BANG returned to New London to train Spanish sailors prior to the transfer. 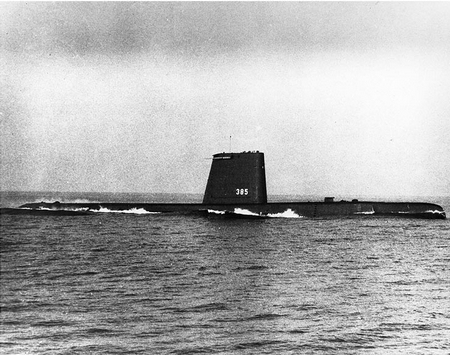 On 1 October 1972, BANG was officially decommissioned, loaned to the Spanish government, and recommissioned as COSME GARCÍA S34. On 1 November 1974, BANG was stricken from the US Navy list and sold to the Spanish government where she served in their Navy until being decommissioned by Spain on September 30, 1982. BANG was sold for scrap in 1983. BANG received six battle stars for her World War II service.